Unseeded Sloane Stephens, who was ranked No. 957 in the world less than two months ago, soared to the top of the tennis world on Saturday with a powerful 6-3, 6-0 victory over 15th-ranked fellow American Madison Keys in the U.S. Open women’s finals. Stephens, who underwent foot surgery and missed 11 months of competitive play, was confident but patient from the start on Saturday in this matchup of two first-time Grand Slam finalists. She broke Keys’ serve in the first set to take a 3-2 lead, capitalizing on Keys’ nervousness. She won the first set on her second chance, when Keys hit a forehand long, and needed three chances to win the match and the title. It was only the seventh time in tennis’ Open Era and second at the U.S. Open that two first-time finalists had played for a Grand Slam title. It also was the 10th time two American women met in the U.S. Open singles final. The last time was in 2002, when Serena Williams defeated her sister, Venus Williams. I don’t know about anyone else, but I really needed this today. 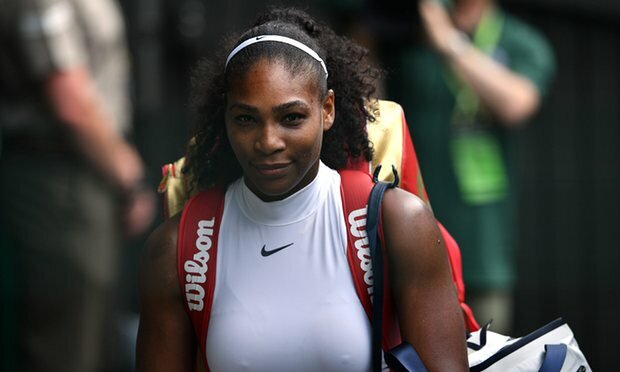 I specifically set my alarm this morning to wake me at 6AM (PST) to watch Serena Williams compete for her seventh – yes, take that in – seventh Wimbledon title, and to tie Steffi Graf for the most Grand Slams won in the Open Era. I’ll admit, regardless of the week of continued brutality and violence by police against black citizens and the gut-wrenching retaliation in Dallas because of such violence, as a lifelong fan, I most likely would have been up and watching Serena anyway. But because of its timing, this victory – this continued rising, this perseverance – was that much more coveted, and that much sweeter. This tweet leads me to speculate that Serena was that much more focused, that much more centered and that much more desirous of the outcome that occurred – because she knew in her heart she wasn’t just winning her 22nd Grand Slam and making history for herself, but for all of us. 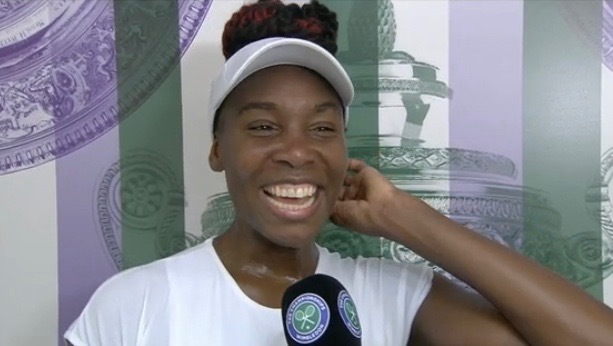 Venus Williams was all smiles, and even giggled a little as she defied expectations and earned a spot in the Wimbledon semifinals in London today, beating unseeded 28-year-old Yaroslava Shvedova 7-6 (5), 6-2. Immediately after her match on Court No. 1, her sister Serena Williams ran through Anastasia Pavlyuchenkova in straight-sets 6-4, 6-4 to book her 10th Wimbledon semifinal. As the announcers have mentioned at every turn, Venus is the eldest player in the tournament at age 36. Advancing to the Wimbledon semis at this age and with her health history is an accomplishment she also acknowledges as special. “You can’t always have this big moment. If you’re Serena Williams, then I guess that happens a lot, but as Venus Williams this is an awesome day,” Venus said in her post-match interview. Venus’s next opponent will be No. 4 Angelique Kerber, also a straight-sets winner today over No. 5 Simona Halep 7-5, 7-6 (2). Before Venus could take her victory walk off the court, mom Oracene and the family were hustling over to Centre Court to catch the beginning of Serena’s match. It stayed fairly even through the first eight games, with no break points earned. Then Williams broke Pavlyuchenkova at 4-4 in the 2nd, and served out the match with ease. Serena moves one step closer to step closer to tying Steffi Graf’s open era record of 22 grand slam titles. Her next opponent will be Russia’s Elena Vesnin. On top of 7 Grand Slam singles titles, tennis phenom Venus Williams can add a new achievement to her resume: Bachelor of Science Degree in Business Administration from Indiana University East. Williams began her education at IU East in 2011, and completed her last course online this summer. During a trip to the Western Southern Open in August, she was able to travel to the campus for the first time. In 2007, Williams received her associate degree in fashion design from the University of Fort Lauderdale, before deciding to go back for a higher degree. After completing the undergraduate program at IU East, Williams stated that she was able to take the lessons and skills she learned in her courses and apply them to her business matters, including a clothing line, EleVen by Venus Williams. Williams is the first female graduate to earn a degree under the WTA agreement between IU East and the Women’s Tennis Benefits Association (WTBA). The WTA represents over 2,500 professional women athletes that represent over 92 nations. Administrators at IU East sang Williams’ praises as an exceptional student with enthusiasm about learning in all of her courses.